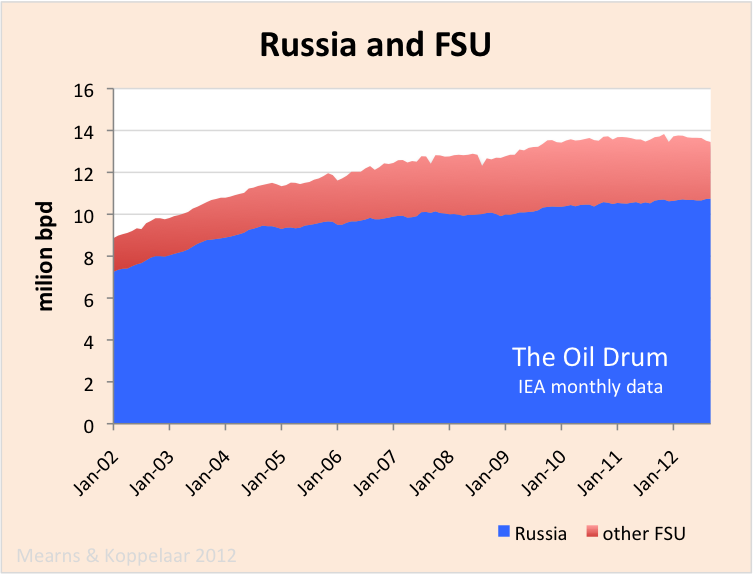 Uncertainty whether Russia can maintain its high level of oil production continues - 10.7 million b/d in 2012 to date on average. A new more benign tax regime recently put into place and significant industry investments may plausibly enable the Russian Bear to extend its “plateau production” to 2020. The post below outlines how this impressive achievement has been made possible, given that the decline of existing production is plausibly 6% or more every year for most old giant fields in West Siberia. In other words, the Russian oil industry needs to invest substantially in pushing more oil from existing fields (lowering decline rates) and new field developments to keep production steady. How long production levels can be maintained beyond 2020 is a difficult question, and one that I have left to answer another day. A view of ongoing developments and things to come up to 2020 is available below the fold. This post was informed by a presentation by TNK-BP’s Oleg Mikhailov held at the unconventional gas conference 27-28 November in Aberdeen, with additional information from investor presentations of major Russian oil companies, a few peer-review studies, and a recent study on the Russian Oil & Gas Sector by Wojciek Kononczuk of the Center of Eastern Studies in Warsaw which I recommend reading. 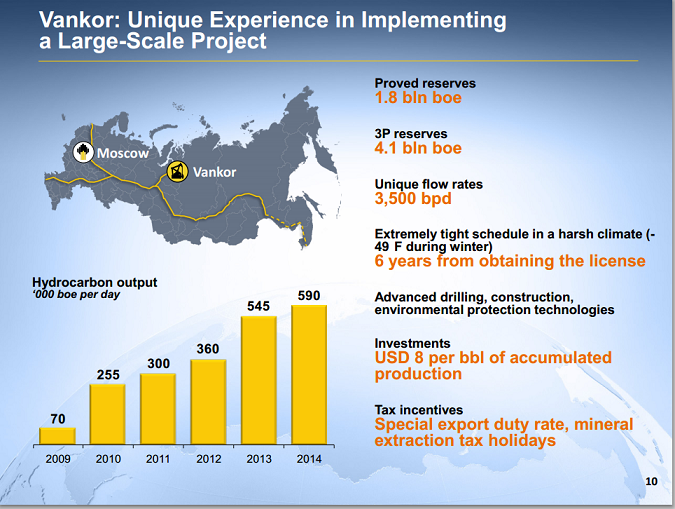 Although TNK-BP recently became a part of Rosneft, making Rosneft the biggest oil company in the world, (see investor presentation) it will be referred here as TNK-BP. 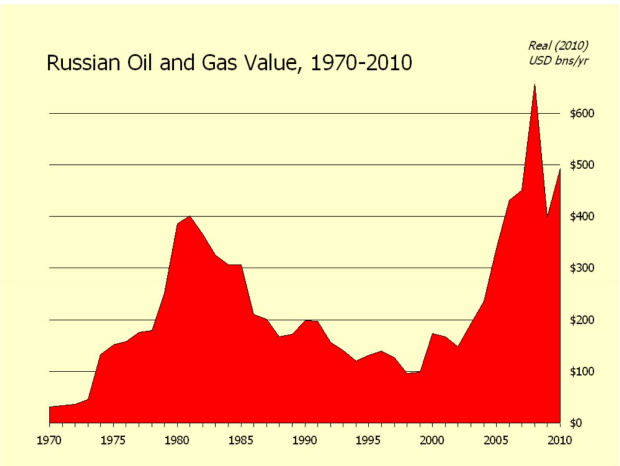 The background of Russian oil production is a story of rapid increase from 3 million in the 1960s to an enduring plateau ±11 mb/d in the 1980s, a rapid drop to 6 mb/d in mid-1990s due to the collapse of the Soviet Union, followed by a revival as investment began flowing again. 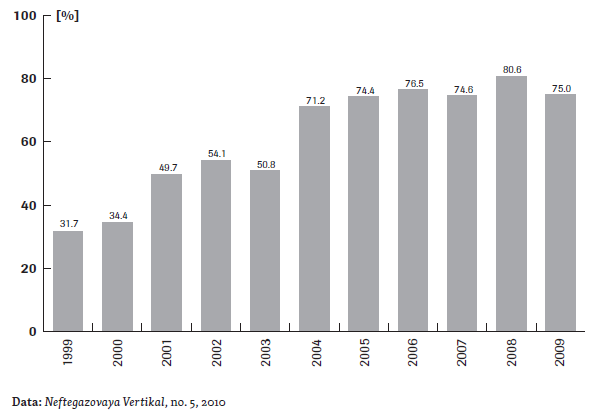 Today Russia is at the point where the production output of many older giant oilfields in West Siberia is declining. It is not an easy job to maintain production given the maturity of these reservoirs. Significant continued investment is required in more difficult to produce reservoirs in West-Siberia itself, in more costly techniques to pour more oil out of mature fields, and in new regions. Thereby costs are driven up due to increasing distance (infrastructure needs), harsher climate, and more challenging reservoirs. To enable investment, favourable financial and oil price conditions are required. To ensure continued high flow rates, the industry is in venturing into remote oil regions and investing in difficult reservoirs to keep production flowing. In the words of Mikhailov, “We are relying more and more on either tight reservoirs or even venturing into unconventional and shale type plays.” Two key developments, investment in difficult reservoirs and tax regime changes, show that the industry and government are indeed making a substantial effort. To recover more oil from these poor quality reservoirs, a range of technologies is deployed that combine multiple leg horizontal drilling, multi-stage hydrofracking, and other technologies. TNK-BP alone has about 10 billion of technically recoverable resources in such fields, and is targeted to exploit 4.5 billion of these under its new “challenged reserves” recovery program, which focuses on 7 development projects. To give an order of magnitude, TNK-BP was the third biggest oil producer in Russia, and total Russian annual oil production is equal to approx. 3.8 billion barrels. The combination of these technologies with brute drilling force (many wells with lots of rigs in use) is what allows production in West Siberia to not decline as rapidly as would otherwise be the case. To make this happen, technical expertise is drawn from service companies like Halliburton and Schlumberger by TNK-BP, and joint ventures with players like ExxonMobil and Statoil by other players. “TNK-BP had 130 multi-stage fracking operations versus 15 last year, and going forward, need to do 1000 well drilling operations or even more per year to access these reserves. Such drilling requires 30%-40% growth in drilling activity. A factor of 5 - 10 for multi-stage operations. We need contractors to invest in this equipment. To expedite this we are working with key oilfield service providers Schlumberger, Halliburton and others,” as stated by Mikhailov. For an example of such projects, here is an interesting news item with quantitative bits on the Severo-Khokhryakovskoe field being developed by TNK-BP and Schlumberger. The development of these projects is enhanced by a recent change in the tax regime of Russia. Historically this has been a huge problem because the Russian state obtains the majority of its income from oil and gas wealth, the biggest driver of the economy. In 2011 50% of state income came from oil & gas. To reduce revenue from your major source of income is always difficult to achieve politically. The rising oil price has led to increasing taxes on the oil industry in Russia on various fronts (including export levies, profit tax, oil transport tax). Reservoir thickness used as a differentiation factor on tax incentives. Relief provided for formations with permeability under 2 milliDarcy. Export duty relief for extra-viscous oil fields (over 10000 cP). Availability of tax relief for reservoirs with an oil viscosity over 200cP. Highly depleted fields receive a tax cut. With several large players and loads of ongoing activity, these development programs will help maintain Russian oil production at today’s levels by slowing the decline in West-Siberia, and unlocking production in more difficult to access regions. 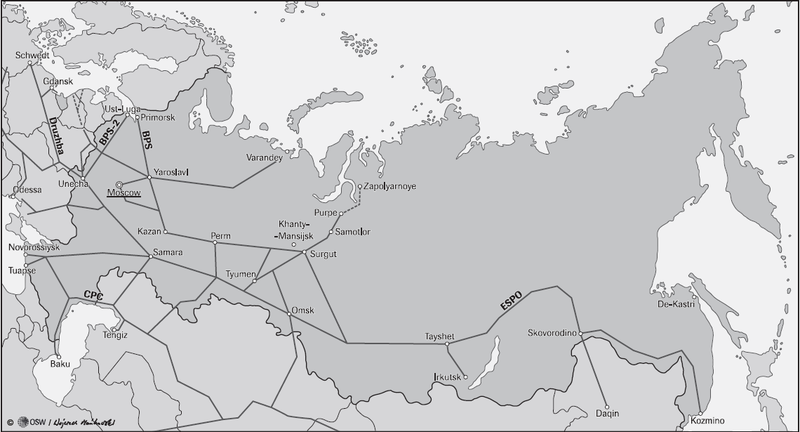 In 2010 the Eastern Siberia Pacific Ocean (ESPO) oil pipeline was completed, which connects East to West Siberia from Tayshet to Skovorodino. It is the first in unlocking transport from East Siberia (2700 km, 0.6 million b/d capacity). 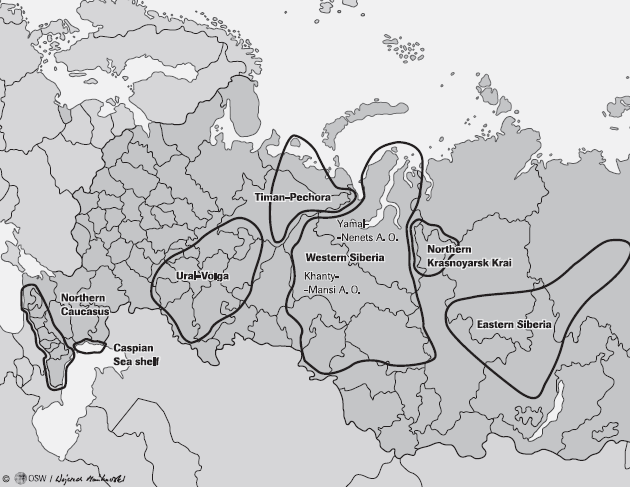 The second phase of the ESPO project is to build a connection to the East coast of Russia for export to Asian markets (1763 km with capacity of 1 million b/d). The oil to the east coast from Skovorodino is currently transported by railway to the Kozmino terminal. The construction is partially financed by China who has loaned Transeft 10 billion USD. This second phase will also expand the capacity of the East to West Siberia link to 1.6 million b/d. A pipeline is under construction from Krasnoyarsk Krai with the first stage to be completeted in 2013 (910 km, 0.5 million b/d capacity increasing to 1 million b/d by 2016). A pipeline is under construction from Tikhoretsk Tuapse-2 to the Tuapse refinery (247 km, 250,000 b/d capacities). Discovery of the 1.1 billion barrels Sevastyanovo field in East Siberia by Rosneft in 2010. The total of new developments are such that as long as investment keeps flowing, production can be maintained at 10-11 million b/d. Total possible production from “challenged reserves” unlocked by the tax regime changes in the next 5-10 years is by some estimates of the order 2 million b/d, sufficient to compensate for declines in other fields. How long production levels can be maintained beyond 2020 is a difficult question to answer. This depends largely on whether new exploration will result in sufficient discoveries such as Sevastyanovo, and whether investment is there to develop these fields in the medium to long term. "Figure 1 shows the oil production cycle of a country in its “declining”phase. The Ex-USSR’s total crude oil and NGL (natural gas liquids) production dropped from 12.5 million barrels per day(MMB/D)in1983to7.2MMB/Din1995. It is suggested that theUSSR’s firstproduction peak in 1983 was the “Hubbert Peak”, while the second peak (12.6 MMB/D) in 1987 represented a “maximum-effort peak” resulting from an all-out attempt to reverse the nation’s first production decline. 3 A symmetrical “Hubbert Curve” (“A”) drawn as a mirror image of the ascending production curve from 1950-1983 through the 1983 peak would intersect the declining production curve at 1996 and continue downward to about 5.5 MMB/D in the year 2000, and to 2.0 MMB/D in 2010. Of course any production from new (Caspian Sea, Sakhalin Island, & other) fields and enhanced oil recovery (EOR) techniques will accordingly increase the Ex- USSR’stotalannualandultimateproductionafter1995. This is shows chematically as a “bump”(“B”)on the right-hand side of the indicated simple Hubbert Curve“A”. (It is quite possible that most nations’ production curves will show a similar “maximum-effort peak” a few years after the local “Hubbert Peak” occurs, e.g. USA production bump in 1985.)" Russia is so vast, has such severe climate zones, and has had such an inept state run oil business for so long that it is very likely that much of the nation hasn't been adequately explored and contains immense untapped resources. IMHO this is the nation that will produce the most fossil fuel based resources for the longest time- long after SA and others have faded away. Does anyone know how many rigs are working in Russia? Just because eastern part of Siberia has not been extensively explored does not mean that a lot of oil will be found there. 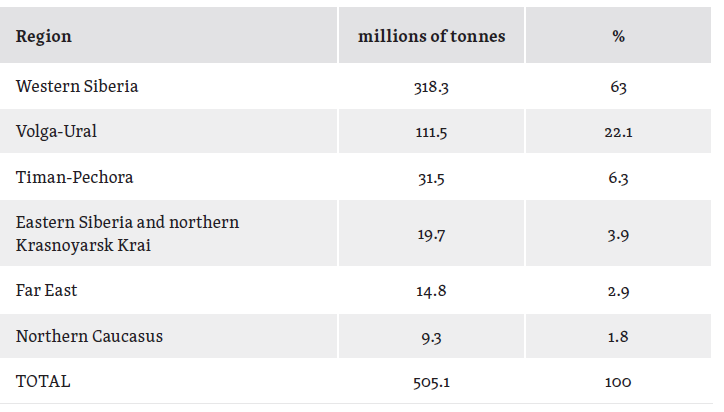 Look at Canada, conventional oil reserves in the west are becoming depleted, except for oil sands. Eastern part of Canada has no oil reserves or potential for any except for a few small areas in the Maritimes. The fact that Russia's new oil plays have such low permeability, shallow pay zone of two meters in many plays, and low flow after fracturing does not suggest huge reserviors. Sure a few fields of large oil resource may yet be found, but then why is BP backing out of its partnerships with Russian oil Cos? Probably not because BP thinks huge reserviors of easy to extract oil remain. Much of that one can be viewed on-line for free at Google Books. While I believe the Russians have valiantly resurected the tired ex-Soviet fields with the help of western oil companies. The rest of the plays (East Siberia/Northern Kray.) will take years of infrastructure and development. Not only will lower taxes play a part, but higher oil prices (I'm thinking $130 to $150/barrel to justify it). These more difficult fields will play out like Prudoe Bay did for the US. Provide a "third" bump on the way down the curve. I recall Darwinian posting at length a few years ago that Russian production had peaked and would shortly entire decline. Since then it appears Russian production has increased (a little) and it appears decline is not really imminent. 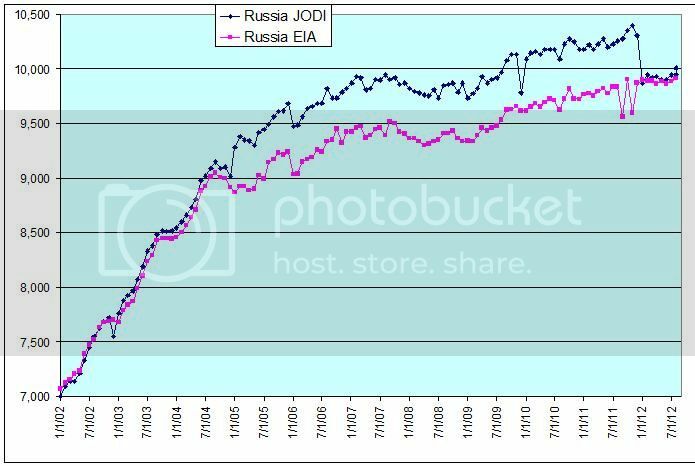 The data from the Hubbert Center in the first post suggests that Russian production peaked in 1983. No, you are dead wrong. I have never argued that Russia had peaked. I argued that Russia was near their peak and would soon peak. I stand by that argument. And I don't think it was years ago, perhaps one year ago or close to two years ago. At any rate I have been discussing Russian oil production for some time now so it could have been any time. 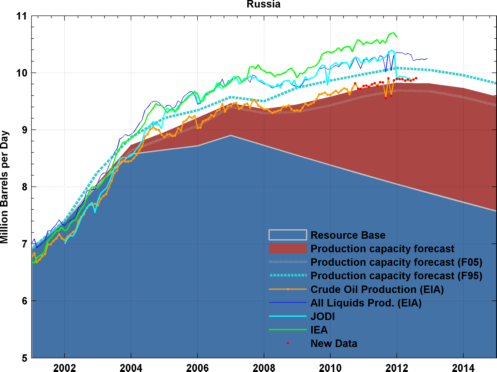 Russian oil production in kb/d. The last data point is August for the EIA and September for JODI. Russian government is ready to auction off the last giant oil fields in Western Siberia this December. Oil reserves of Lodochnoye, Imilorskoye and Shpilman fields are estimated at 2.3 Gb total. It seems that Russia has reached at least a plateau. Note that JODI is matching the EIA (all liquids) between 2005 and end of 2011, now it is matching EIA Crude oil only. I suspect the reporting is inconsistent, they sometimes includes NGL, sometimes not. How do you account for 'off-books' and 'not-so(mega)' projects ? 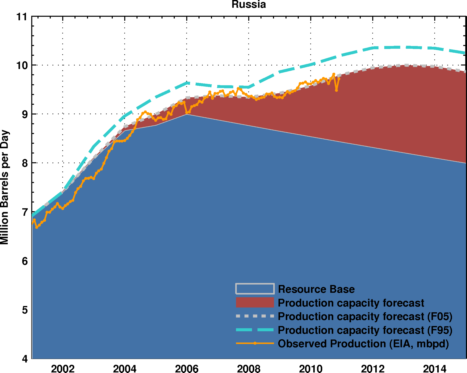 Megaprojects seem to reasonably forecast future production for Russia, what about the USA ? BT - Interesting aspect of your chart: if one projected future growth in Russian production in 2004 they might have thought they would be producing at twice that rate today. And if they knew the rise in oil prices we've seen since 2004 they might have even projected a much higher current rate. And they obviously would have been very wrong. And now some folks want to take increases in recent years and make similar assumptions. Many folks still don't understand the distinction between projections and predictions. A 7 yo child can make a projection just as easy as a 60 yo Ph.D. - just give him a plot and a straight edge. Predictions require much more effort. More important require a very detailed data base which is often unavailable. I look at the chart and think, roughly symmetric production curve with the future falling edge a little steeper than the rising edge. Because Russia is producing flat out, they get a nice smooth curve while Saudi Arabia's curve is jagged as they bring on new large fields or cut back production as a swing producer. Russia’s crude oil and condensate output climbed to a post-Soviet record of 10.503 million barrels a day in November, beating the high reached the previous month, according to the Energy Ministry’s CDU-TEK unit.